Then Kim told Kristina, the teacher, and then everyone found out. Including Amie, one of my favorite instructors, who is great friends with Kate Kasbee of Well Vegan. Kate lives in Chicago and was working on a cookbook called Frugal Vegan at the time. Kate came to town for Amie’s birthday party, so I met her for drinks, and a giant green bug landed in her herbed green cocktail. Are you still following? I can’t make this stuff up. Kate and I bonded over the trials and tribulations of cookbook-making, our love for our funny-looking pups (meet Rex), and the green bug experience. We practiced our half-moon poses at Amie’s backyard birthday party the next day. Maybe I shouldn’t be so shy about my work, since it opens so many fun doors. Today, I’m sharing a delicious recipe from Frugal Vegan, featuring cabbage, carrots, green onion, snow or snap peas, and cilantro—all fresh, affordable, and loaded with nutrients and fiber. 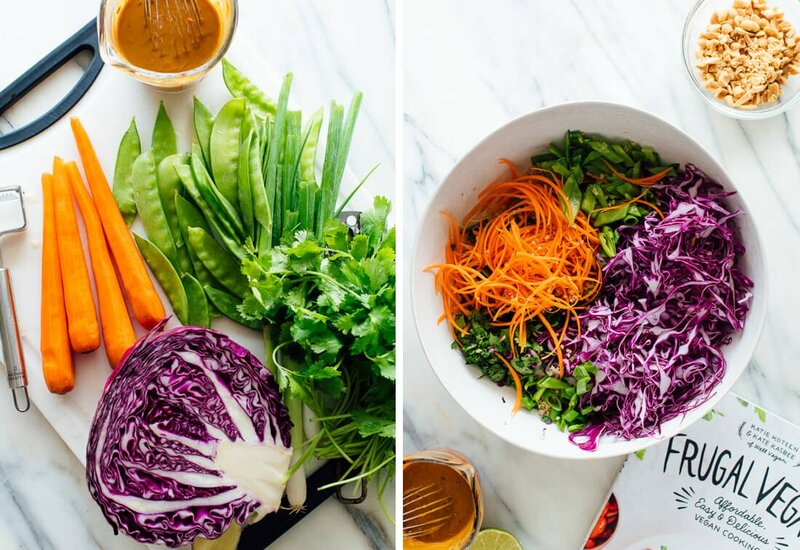 Toss all of that in an addictive homemade peanut sauce for a crisp, colorful, Thai-inspired salad. Enjoy it as a light summer dinner, and pack up the leftovers for tomorrow lunch. The book’s recipe calls for millet instead of quinoa, but I picked up all of the other ingredients at the store, while assuming that I had millet in my pantry at home. I did not, so I used quinoa instead. Millet is less expensive but quinoa has more protein, so take your pick accordingly. It’ll turn out great either way. Enjoy, and be sure to check out Kate and Katie’s book, Frugal Vegan! 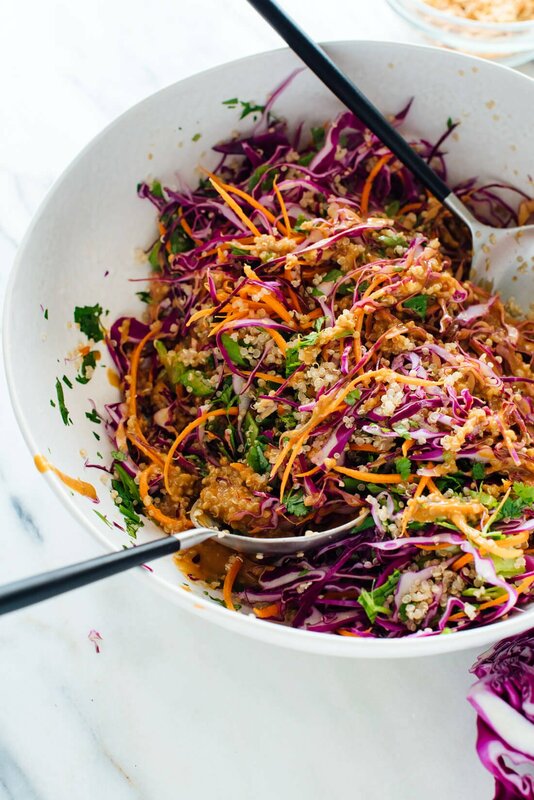 This Thai-flavored salad recipe is made with carrots, cabbage, snow peas, and quinoa, tossed in delicious peanut sauce. 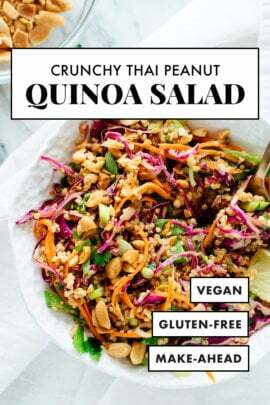 This healthy salad is vegan, gluten free, and packs well for lunch. Recipe yields 4 salads. Meanwhile, make the peanut sauce: Whisk together the peanut butter and tamari until smooth (if this is difficult, microwave the mixture for up to 30 seconds to loosen it up). Add the remaining ingredients and whisk until smooth. If the mixture seems too thick to toss into the salad, whisk in a bit of water to loosen it up (I didn’t need to do this). 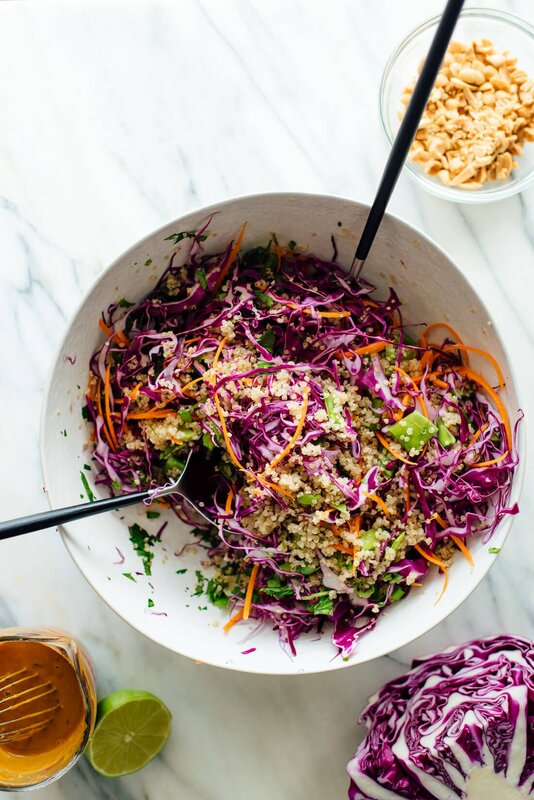 In a large serving bowl, combine the cooked quinoa, shredded cabbage, carrot, snow peas, cilantro and green onion. 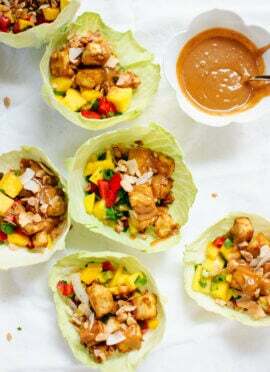 Toss to combine, then pour in the peanut sauce. Toss again until everything it lightly coated in sauce. Taste, and if it doesn’t taste quite amazing yet, add a pinch of salt and toss again. Divide into individual bowls and garnish with peanuts. This salad keeps well, covered and refrigerated, for about 4 days. If you don’t want your chopped peanuts to get soggy, store them separately from the rest and garnish just before serving. Recipe minimally adapted from Frugal Vegan by Katie Koteen and Kate Kasbee. Make it vegan: Use maple syrup (or agave nectar) instead of honey. Make it gluten free: Be sure to use certified gluten-free tamari, not soy sauce. Though I am a cilantro lover, I substituted Thai basil to match the palette here. Also used edamame instead of snow peas. Balance of the dressing was just right. Thanks, Kate! I made this salad for the first time a few weeks ago and it instantly became a go-to recipe! It is sooo healthy, crunchy, filling, comforting and insanely flavorful. I wasn’t super strict with the measured quantities for the peanut sauce, and I used this random peanut butter in our fridge that had some sugar in it. Overall it was delicious and it keeps pretty well, with the peanut sauce kept separately! delicious and easy. Found it made 3 servings but could be because I over served. How much sauce does this make? I may just buy store bought peanut sauce if it is the same. I’m a terrible cook. I made the vegetable lasagna and my family has now declared it one of the best things I make (out of 3). My husband and son who scoff at my vegetarianism declared the veggie lasagna to be better than meat lasagna. We make this all the time and play around with different vegetables. And..sometimes add chicken for the meat eaters. This is one of the most satisfying recipes ever. It’s beautiful to serve. Thank you, Sharon for sharing! I didn’t expect for this recipe to be so good. The ingredients were bit out of my comfort zone BUT my husband and I loved it! It is so good. I find myself using your website more and more. Thanks! I’m glad you went outside your comfort zone! Thanks for the review. Wow! This is absolutely DELICIOUS and filling! It is the perfect amount of healthy, crunchy and satisfying. Definitely adding this to my rotation! I love all your descriptors, Lindsay! My thoughts too. Thanks you for your review. I made this salad for dinner last night. I really liked the flavor, color and crunch. To my surprise, my husband also really liked this salad to. He even had seconds. I will definitely be making this again. Hooray! That’s great, Kim. You know you have a good one then. :) I appreciate the review. Made this tonight for dinner. It really hit the spot. My husband and I couldn’t believe how satisfying and filling it was. Definitely going to put this one in our dinner rotation. Win! I’m happy to hear that Gretchen. Thanks so much for the review! Yummy!!! I just made this for a bbq. Doubled the recipe and used almond butter instead of peanut butter (It’s what I had on hand). Delicious!!! And I am guessing it will be even better by this evening! It is a keeper for sure. Almond butter works! Thank you, Kelly. This salad is simply OUTSTANDING – tastes great and feels so healthy. The addition of the slivered snow peas is a great surprise – adds an interesting flavor that you can’t quite put your finger on because they don’t look like peas when julienned like that. The quinoa also adds a little chewiness, and the dressing is divine. Will be serving this to guests! I’m happy you think so, Mariann! Thanks for your review. This salad is one of my favorites and tastes amazing even without all the ingredients. I only had green cabbage and didn’t have snow peas (I just used extra cabbage and carrots) or rice vinegar and it was still super yummy! Even some of my friends who weren’t fans of quinoa ended up asking for the recipe and making it since they liked this salad so much. The peanut sauce is definitely a keeper. Wonderful, Kateri! Thanks so much for sharing and for your review. I love to hear how you make it your own. I used almond butter and added some shredded kale to make it a little heartier. Delicious! Great! Thanks for the review, Lauren. Hey! I don’t have creamy peanut butter. Would crunchy peanut butter be an okay substitute for the dressing? I wouldn’t recommend it as it wont blend near as well and then you will have peanuts in your dressing. I am obsessed with this salad! No wonder, since it features 2 of my favorite ingredients, cilantro and peanut. It is perfect for a crowd and keeps really well too. Many people who tasted it asked for the recipe! I always come back to you website for recipes. Love the layout, the pics of the yummy recipes and the way you write. I have recommended it over and over. Great work! I’m making a few of your salads today actually! Thanks for always coming back and for your recommendations. I really appreciate the support. Thanks for the review. Wow – I made this exactly as written (except I withheld the cilantro) and it is AMAZING. I’m not vegan or GF, but I love all of your recipes I’ve tried so far. This is one of my new favorites. Best lunch ever. Thank you, Loren! I’m glad you still liked it without the cilantro. I appreciate the review. I’m normally not a big fan of peanut sauce, but I think that’s only because I’ve never had a good one – wow! I was practically licking the bowl I used to make it! Thanks for another great recipe, Kate. This will be my standard lunch recipe for the indefinite future. I’m glad this one changed your mind, Alyssa! I appreciate the review. OMG, amazing! This is the second recipe i’ve made from your site this week. My usually critical husband described it as “restaurant quality”. Delicious. I love to hear that! Thanks so much, Rachael. Made this on a hot summer day. Really delicious! The peanut sauce is fantastic. Really great flavors. And budget-friendly! With a small red cabbage, I have plenty left for a second salad – so now I’m going to make your Hot Pink Coconut Slaw! Wonderful! Thank you, for your review. This was delicious, and so easy to put together. I cut the cabbage by hand and used a box grater for the carrots. The sugar snap peas were a great addition – loved the crunch and light sweetness! I also added in some thinly sliced red peppers and left out the peanuts (because I forgot to add them :) ). I will definitely be making this again! Thank you! You’re welcome, Kathy! Thanks for trying and for your review. Really enjoyed this salad! Tasted delicious and the colors were amazing. Can’t wait to eat the leftovers for lunch tomorrow! Leftovers, delicious! Thank you, Christina. We absolutely loved this recipe. It is perfect for a warm summer night! Wonderful, Molly! Thanks for your review. Really simple to make and so tasty! Thanks! I’m glad you thought so, Amy. Made this tonight. I love it! Will make again for sure. We made this for dinner last night and it was amazing! Colorful, crunchy and delicious, my picky 13 yo devoured it and asked if we can add it to the rotation as a school lunch. This is now a summertime staple. Great to hear, Shannon! Thanks so much for your review. LOVE this!!! Super easy. I sometimes cheat and buy the mixed bag of cabbage and carrots so I don’t need to chop up the veggies.. Also I usually double the sauce cause it’s so good…. Sometimes you just need to do that! Thanks for sharing, Johanna. Any suggestions for substituting the quinoa? Millet also works here too. Oh wow this salad is amazing!! This was delicious. My meat eating husband declared it the best salad I’ve ever made. I used edamame instead of the peas just because that’s what I had on hand and added a diced red pepper. It was a wonderful meal. Hooray! That’s great. Thanks for sharing. Two thumbs up. I was out of fresh ginger, and I left out the snow peas, but this is still a rocking recipe. I like the crunch of the cabbage and carrots. A tasty summer meal for a hoy July night. Delicious. Thank you. I love this recipe! 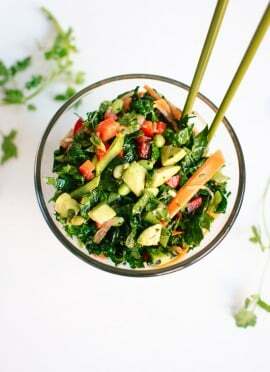 I don’t usually like raw veggies but I know they are generally better for you then cooked ones so it’s nice to find a recipe with raw veggies that I actually like. I’m going to try it with mail it to next time! I think red pepper would also be good in it. I’m glad this salad gets you to like raw vegetables. :) I appreciate the review! Another fantastic recipe! Thank you! A-maze-ing. The vegetable mix looked so beautiful I was reticent to blend in the quinoa, so I served it separately. I followed the recipe except used regular cabbage only because that is what I had on hand. The peanut sauce was the perfect amount and really flavorful (I went heavy on the ginger). Serving the quinoa separately allowed us to blend it into the salad as desired on our plate and – surprisingly enough – it was even better once I blended it into the vegetables. This recipe hit my “board of fame” where I keep my favorite go-to meals, so I will revisit it often. Do I add the dressing if I plan to store the salad in the fridge for couple of days? Thanks.. looks delicious! Yes, you can if you like! I’ve made this twice within a week, it is so good! Great for lunches and dinners, super easy to make. I agree! This is great for lunches. Thanks, Jane for your review. The salad turned out awesome!!! Great to hear! Thanks for the review. I’ve made this recipe twice now to both vegetarians and non and everyone loved it. I can’t wait to make it again for more people and see what they think. Thank you, Karen for sharing! This was so good! I substituted seedless cucumber for the snap peas as that’s all I had. It was amazing! Absolutely love this salad! I made a big batch of it, and am eating it for lunches at work. Swapped out some of the veggies for what’s in season now. Easy to make, simple to clean up, and oh so tasty. This is definitely going into my regular rotation. Great lunch option for sure! I don’t freeze all my recipes, unfortunately. I wouldn’t think this one would freeze very well with the salad components. Delicious. I made the very wise decision to double this recipe and am so happy today that I have leftovers. It’s as delicious as it is beautiful. Thanks for sharing. Just wanted to let you know that I’m making this dish for the unpteenth time tonight to take to a dinner party. It’s always a hit. My husband says it’s “restaurant quality.” Thank you so much for all of your delicious recipes and your cookbook! You’re so sweet, Blaine! Thanks so much for your review. I’m glad it’s always a hit! I just made this (followed the recipe to the T) and it was amazing!! Definitely making it all the time. Love to hear that, Leah! Amazing! Thanks for such a fabulous recipe. The sauce is to die for! I didn’t have snow peas so I subbed broccoli and I added diced avocado. Will be a repeat in my household for sure. The sauce is so good! I’m glad you agree, Emily. Thanks so much for sharing your experience! I’m a sophomore in college so eating healthy can be difficult with time and budget restraints. I made this salad on a Sunday and it lasted me until midweek. I loved this salad because it was 1) easy to make 2) super tasty and 3) healthy and light but still substantial enough to be a meal. In short, it’s been a success! From now on, I plan on making a salad like this (most likely from your website) every weekend to last me for the beginning of the week so that I can have access to a yummy, healthy meal in a pinch. Thanks Cookie and Kate! You ARE the queen of salads! This is delicious….will definitely make this again. Thanks for the title, Vonna! You’re so sweet. I’m glad you liked this one. Do you eat this hot or cold? It is really lovely either way! You can server right away or serve as leftovers. I made this and subsituted a bag of tri-color cole slaw mix instead of the purple cabbage, carrot and snap peas. I added some finely chopped red pepper for color and omitted the cilantro since my husband doesn’t like it – and left in the green onions. I made the dressing as directed and it was wonderful. I’ll definitely be making this again. Thank you for sharing your variation, Karen! OMG! Kate you are really genius. All veggies and carrots slice is fine finished. I’m thinking how you have done this. I’ll try it tomorrow. I want to take this salad with my chines dishes. Thanks for sharing such type of value return presentation. This is one of those recipes I can eat (minus the snap peas). I am currently on the FODMAP diet. All my life I’ve been able to eat whatever and whenever. I now have this annoying gut problem. I was wondering if you could use that creative mind of yours and help me along? In the meantime I have full intentions of scouring all of your recipes and looking thru my purchased cookbook/Love Real Food. Hi Charlotte! Sorry to hear that. I’m not an expert there, but I hope you can find recipes that work well! I just made this and it’s DELICIOUS. Wrote it on a recipe card for my recipe box to make sure I never lose it! I love hearing that, Rachel! Thanks so much for your review. So delicious and easy to prepare !!! Love it! It’s so good! This is OMG so good. This is the first recipe of yours I have tried. Since I am retired now, I will spend hours today looking through yours recipes for the ones I want to try next. Thanks for a go to recipe, love it! I’m glad you loved it, Leessa! thanks for your review. I wanted to make this salad due to all of the raving reviews. Well, I wasn’t disappointed! This salad is amazing. It’s going to be in rotation for sure from now on. 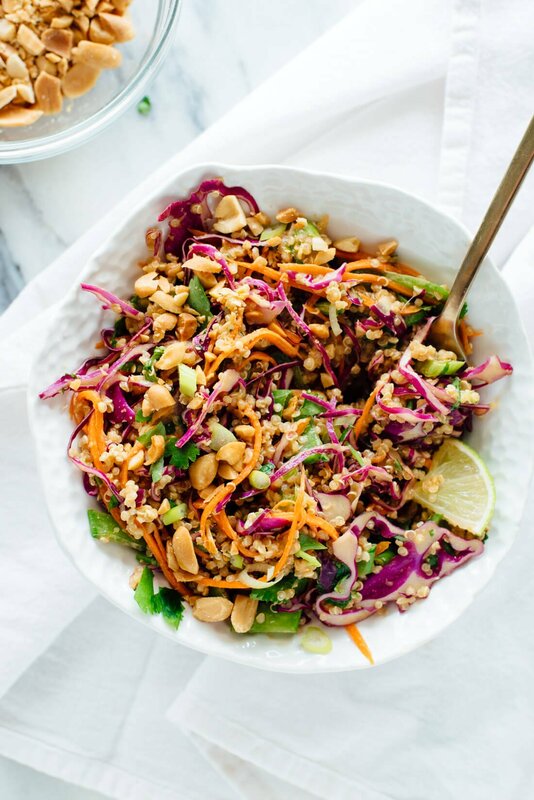 Love love love a thai peanut salad! Wonderful, Chelsea! I’m glad it lived up to the review! Do you serve this hot or cold? Either way! I’ve had it both and it’s delicious. I made this recipes into spring rolls and it was delicious! Just added sriracha and it’s perfect! great recipe family loved it! Nice and light and flavorful. My boyfriend and I have been following along with you since the new year looking for new recipes! We are loving them all! This recipe is our constant GO TO! Thank you so much for sharing Kate! You’re welcome, Gaby! I’m glad this is a go-to. Just made this salad and made a double batch for my family. It is soooo good! I’m letting it sit overnight so that the dressing can really soak in. That dressing is amazing! Thinking about other ways to use it. I love it! Thanks for sharing, Lisa. Made this for a potluck and my friends absolutely LOVED it! I made a bit more of the dressing and ended up using tahini because I was out of peanut butter – worked well! Great to hear, Hazel! Thanks so much for your review. I made this yesterday for dinner with some friends and EVERYONE loved it!. Thank you for sharing this. I was so easy to make and delicious! I omitted cilantro because I don’t care for the taste but it still turned out fantastic! You’re welcome! I’m glad it was such a hit with everyone, Nneka! Another perfect salad. Quick and easy to make, fantastic texture and amazing depth of flavor. So, so, so, so good. Yum. I made this, and have to say, I was skeptical as I am not a quinoa lover, but it turned out great, very satisfying and crunchy. I used a nut butter blend instead of peanut butter. Makes lots though if you are only cooking for two, lots for leftovers. Served it with a bowel of the Best Lentil Soup recipe (also a great recipe) my husband loved both. I forgot to fill in the stars, definitely a 5 star. I’m glad you tried it, even though you were skeptical! Thanks for sharing, May. This salad is delicious! I didn’t have snow peas so added a little more cabbage. I also used two teaspoons of ginger. The dressing is really yummy. I had to put it in the fridge before I ate it all! I love it, Erin! Thanks for your review. I’ve made this recipe a number of times and it is a winner. Over time I perfected the dressing by using tahini instead of peanut butter, tripling the amount of lime juice and adding half a seeded jalapeno or Serrano pepper. Fabulous! Thanks for sharing, Dave! I’m glad you love this one. I’m trying to find ways to include quinoa in my diet. This is definitely a winner! 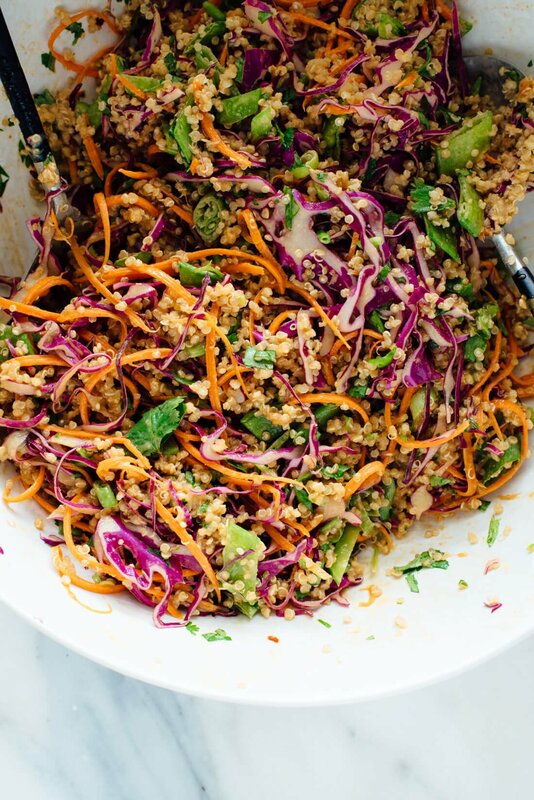 The slightly bitter flavor of the quinoa blends perfectly with the Asian influence of this salad. I’ll be making this again soon! Happy to hear this was something you were looking for, Karen! Thanks for the review. Kate, my hero! You’ve done it again! I made this last night and brought it for my lunch today and IT IS SO GOOD! I was debating adding the dressing as I worked my way through the salad, but I added it all at once, and the salad is still crunchy and the dressing flavored everything wonderfully! I added in the peanuts when I was ready to eat so they wouldn’t get soggy. Next time, I’m thinking I’ll add more pepper flakes or some siracha for a little more spice. You’re so welcome! I’m excited you are loving this one. Yessss love it. I never leave comments but iloved this recipe. I substituted parsley for cilantro and edamame instead of snow peas. I also added some jalepeno. Delicious and would add this to my go to recipe. Love rhe sauce- so versatile. I had some leftover carrots and dunk it in the sauce- had to stop myself! Recipes usually take me over an hour bc im slow but this was very quick. Thank you!! Thank you for commenting and letting me know you loved it, Jessica! Yum! This was delicious. I find myself constantly craving Thai food and scrounging through random bits of lime/ginger/peanut butter/soy sauce/sesame oil/crunchy things in the kitchen to try and whip up something to satisfy. This was easy to put together and super yummy! The quinoa adds a nice texture to the dish. 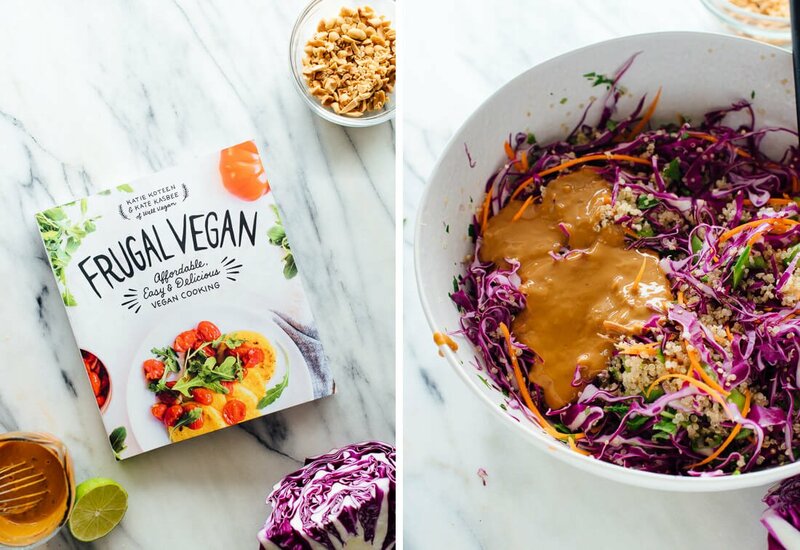 Such a great peanut sauce for a quinoa salad! Thanks for the review, Pernille! Made this tonight and it was great! The nutrition information isn’t listed, do you by chance know about how many calories per serving? Thanks! Hi Dawn! Thanks for sharing. I’m glad you liked it! It appears to be working for me. Make sure you allow cookies as this is a plug-in on my blog. I hope this helps! Absolutely delicious! Made it for my lunches, but the SO can’t stay away from it. And he hates Cilantro. Definitely a keeper. Is this still good if you make it a few days ahead? Going to make it for a dinner party. This salad is a great leftover option, so should do fine. Let me know what you think! Today was the second time I prepared this salad. Since I ran out of quinoa, this time I added rice noodles. Hands down, this is one of my favorite salads. This is a very delicious recipe. Thank you for sharing. Kate, This is delicious, beautiful and satisfying! I will definitely make it again…and again. My vegan son is home from college and I served this salad as our dinner tonight, with a bowl of blackberries for dessrt. It was a hit for us both. I added some cubed baked tofu and topped each portion with a squeeze of sriracha – I may try some finely diced jalapeno next time for some extra heat. Leftovers will be eaten tomorrow, I’m certain. Thanks for a great recipe! I love your blog. I’m happy you are so excited about it and that it was a hit! Thanks for your review, Rhonda. This recipe is a home run for me. Took this to a potluck and got rave reviews. My husband, more of a meat and potatoes guy, thought it was delicious. I like that I can make in advance without peanut garnish and it keeps for days. I’m new at cooking without dairy and wheat; your vegan recipes are so helpful to me. Thank you for sharing, Susan! Great, Melissa! Thanks for sharing. I’m not a huge fan of snow peas, so I used a diced red pepper instead. I needed 3 tablespoons of water for my dressing. Other than that I followed the recipe exactly. It’s my new favourite lunch salad! I’m happy it’s a new favorite and red pepper sounds delicious! Thanks for the review, Hayley. I can hear my husband groan when he sees me cooking quinoa but he LOVED this and almost looked like he couldn’t believe these words of appreciation were coming out of his mouth. I did have to alter it due to what was on hand, so, I didn’t have the peas but threw a lot of that ready cut coleslaw into the quinoa and fluffed it up with finely chopped kale. The sauce was fabulous but I had to substitute lemon for lime and I’m sure the lime would be even better! It’s a keeper. Thanks so much for the great recipe! That’s too funny! But, I’ happy he liked it, Angela. Thanks so much for sharing and for your review. Absolutely delicious! Easy to make. Great flavors and texture. I prepped the salad ingredients and sauce earlier in the day, then put it all together at dinner time with the peanuts and cilantro on top. One of the best salads I’ve ever had. One of the best! I agree it’s so good. Thanks for your review, Meredith. I just made these for lunch for myself and my husband and they were absolutely delicious! I have never used raw brocolli in a recipe but it worked perfectly, adding some crunch to the texture. Each mouthful was a wonderful explosion of the freshest flavours. Thanks for sharing, Jill! I’m glad you were able to enjoy another one. Looks Awesome… Thanks for sharing such a delicious recipe. Hi Kate! I love your recipes. Do you have any suggestions for making this recipe less crunchy? (gasp) I have bad jaw pain, but this looks so good! Maybe I could super quickly cook some of the ingredients & chill them, or leave the sauce on the salad overnight in the fridge? Thinking of adding some kind of noodle to this! Thanks! Oh no! I’m not sure this one would be for you, unfortunately. I’m sorry to hear about your pain. That doesn’t sound fun! Made with green cabbage and red quinoa, and subbed celery for snow peas, and we loved it! Thanks for great recipe! I’m glad you loved it, Cindy! Thanks for your review. I tried this recipe the other night (and a few of your others over the past few months, which I have all loved) and it is such a bliss! I served it with some crispy marinated tofu for a little extra protein (and because, why not?) and it was amazing! Can’t wait to have the leftover for lunch tomorrow. Love love love your blog. Crispy tofu would be great with this! Thanks for sharing, Margot. Absolutely a delicious combo of crunchy, savory and sweet. This tasted better than similar salads we´ve had in restaurants. Will make this again and again. Amazing recipe! I made this with 3 changes, I didn’t use peanuts as I didn’t have any, I added spicy samba and I used twice as much lime juice. I will be making a second batch tomorrow! This is fantastic!! I altered the recipe slightly based on ingredients I didn’t have or wanted to change… Apple Cider Vinegar instead of Rice Vinegar, Crunchy PB instead of Smooth, Agave instead of Honey, Regular Soy Sauce instead of Low-Sodium Soy Sauce, and Radiccio instead of Red Cabbage. I’m very grateful for your website. I have learned to love the process of cooking, not just the finished product. Thank you!! An excellent recipe! East to prepare, economical, colorful and flavorful beyond measure. Also easily adaptable to various tastes and ingredients on hand. A bookclub hit! I’m happy to hear you love it and so did your bookclub! Perfect! I found this recipe on Pinterest when I noticed the 5 start rating. I have made many “5 star” rated recipes from Pinterest, only to discover they were rated BEFORE making the recipe. I made this one exactly as stated and it was fantastic. Very full of flavor, fast, stores well for days… I cannot give it enough compliments. You won’t be disappointed! I’m glad you loved it! Have made two separate batches/weeks of lunches out of the ingredients to this recipe – it lasts really well and the dressing is amazing!! A+ overall, have recommended it to everyone I know. I’m so glad you loved it and will recommend it, Sandy!